Majestic Flag Store Custom Flags – Made to Order! Custom Flags – Made to Order! Have you ever thought about commissioning a flag for a special occasion or event? How about a promotion for your brand? What better way to commemorate or advertise your event, brand, or community than with a made to order custom flag?! Our custom flags are 3′ x 5′ and can be designed and displayed either horizontally or vertically, whatever suits your needs. For under $40 each, you can get a flag with your own special design. You can use your logo, a picture of your face, a picture of your dog’s face…it doesn’t matter, we can make it work! If your file can be emailed, it can be printed! And as a special introductory offer, we’re waiving the typical $25 setup fee so the price you pay is truly only $39.99! 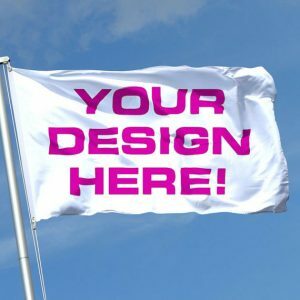 No hidden fees or surprise costs, just a flat rate of $39.99 and a custom flag with your very own artwork can be yours. While you’re at it, think about how you’re going to display your flags! We can help with all your flag pole needs, as well…just click here to see our flag pole options!